Yes, you are right. On July 31, 2018, Google announced that with the update of Google Cook app, Clock is available to use Spotify music as alarm without problem. But you should know that this Google Cook app works for Android only. If you would like to set Spotify music as an alarm for iPhone or other iOS devices, you need to use Spotify to MP3 Converter for Mac to convert Spotify files to iPhone and then use iTunes to edit Spotify files as alarm with ease. 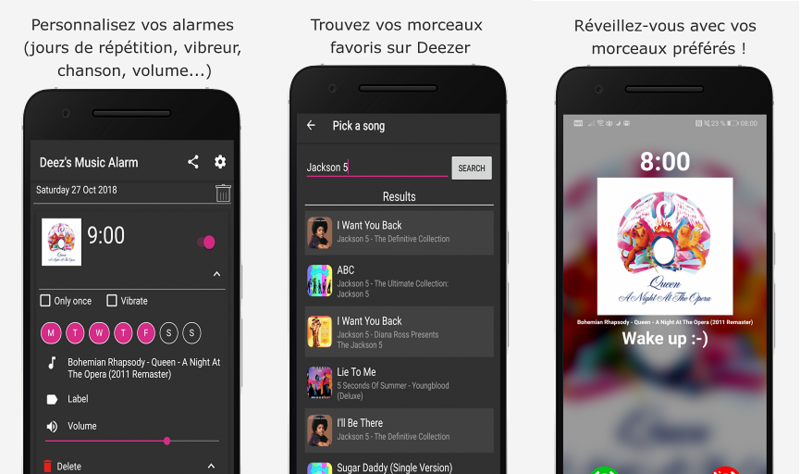 I'm sorry, the text on the images is written in French, but it is a simple alarm clock application (available on Android devices) which allows you to wake up to your favourite Deezer tracks, albums playlists and even your "flow" ! This application has been developed independently from Deezer. You can even become a beta tester if you want to get the new features before everyone else ! For example, the current beta test has a Timer functionality..! When will Deezer have native support for Android clock? Is this something Deezer is working on? Does Deezalarm let you stream to chromecast audio? I used this app in the past . This app is the most stable I could find for Android so far . Nice work dev . Thanks. Does it allow you to stream audio to chromecast?